“It is a capital mistake to theorize before one has data.” You’d think this quote was from a modern business strategist, but it’s actually Sherlock Holmes (aka Sir Arthur Conan Doyle) in the 1892 short story A Scandal in Bohemia. Nevertheless, this statement applies directly to today’s business world. Technology is helping organizations get smarter about how they collect data, use it to ask better questions and make more informed decisions. But can the same be said for the L&D function? Are we making effective use of the right data to inform our strategies and support the organization’s goals? L&D is under renewed pressure to justify its value to the organization. At the same time, L&D teams want to evolve from cost centers to strategic business partners. Data is the key in both conversations. L&D must evolve its measurement practices beyond traditional metrics like completions, training hours, quiz scores and satisfaction. To validate the impact of learning, we must collect and report on data that establishes a clear value chain between the resources we provide and the desired outcomes for the business. Unfortunately, L&D still dedicates most of its measurement efforts to just collecting and organizing data (Bersin – 2015 State of Learning Measurement Report). Considerably less time is spent sharing insights within the organization to improve the impact of learning opportunities. I had similar experiences in my past L&D roles. A lot of time and effort went into exporting data from the LMS so we could then build spreadsheets and charts to be emailed periodically to stakeholders. This challenge is exacerbated by the fact that less than 50% of L&D teams have a staff member dedicated to measurement. In my case, most of our data collection and reporting was done by the LMS admin, simply because that person had the access and could build pivot tables. To evolve our measurement practices, L&D must get critical learning and performance data into the hands of the people who can take action—business leaders and frontline management—as quickly as possible. Rather than emailing around difficult-to-decipher spreadsheets weeks or months after a training event, L&D must provide real-time insights into employee knowledge gaps, behavior challenges and compliance issues. 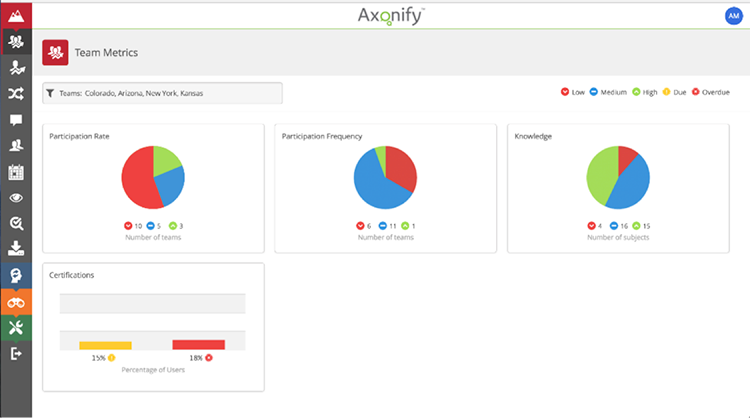 Axonify LeaderZone is designed to do just that—put actionable data into the hands of those outside of L&D to improve their coaching outcomes. 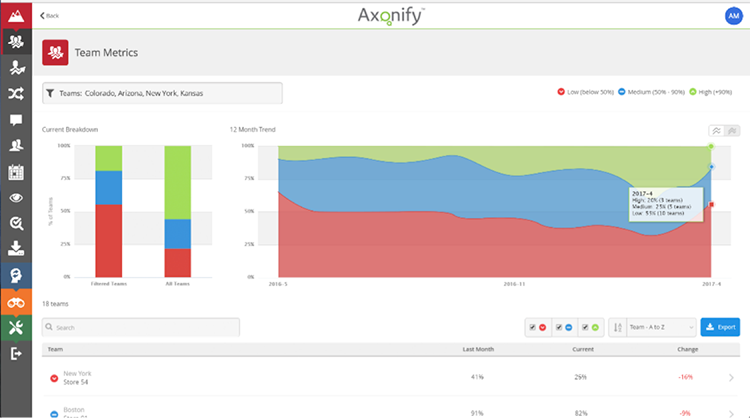 Today we’re taking this idea a step further with our newest insight capabilities—Axonify Team Metrics and Compare. Team Metrics provides extended reporting visibility to all levels of management and, in particular, senior business leaders across the organization who have never had access to this kind of actionable learning data before. The visual dashboard breaks down team performance and focuses on four leading indicators: Participation, Frequency, Knowledge and Compliance. Leaders can then drill into their teams’ metrics to quickly see how their performance is trending, and take action to support teams that are falling below expectations (before these problems have a negative impact on the business). For example, regional vice-presidents can log into Team Metrics at any time and see how each of their locations is performing without requesting any extra reports from your L&D team. The “Compare” feature takes this reporting one step further by giving senior leadership (those who oversee multiple departments, regions or locations) the ability to compare teams, locations and regions to one another as well as the company average. It allows organizational leaders to quickly identify teams that are out of compliance or lacking in engagement and step in proactively rather than only hearing about the issue after it has become a huge problem. Simply put, Axonify Team Metrics and Compare help L&D teams get the right data into the right hands in real time to improve learning outcomes and drive business goals. To learn more, check out our Team Metrics Video.